I knew it, the day would come, and today it happened. 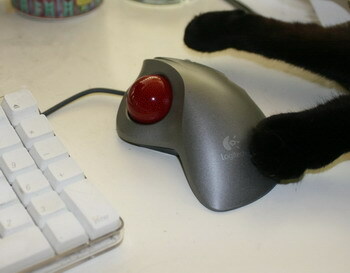 The cats have hogged the trackball. Are they going to have Finch a l’Orange and Buffalo Mice delivered? One thing is certain; I will keep a close eye on the credit card statements. You’re baked and buttered now. You’d better cut up the credit cards now, because those cats are looking stuff that’s priceless. Yes, stick a fork in me, I’m done.